You don’t often get the opportunity to see just what healthy grass roots should look like. We’re currently growing grass plugs organically in our new Aquaponics system. Because the plants are grown hydroponically, you can really see the entire root structure. So we snapped a few photos so you can see what a healthy deep root system looks like. This is a St. Augustine grass plug currently growing in our organic aquaponics system. 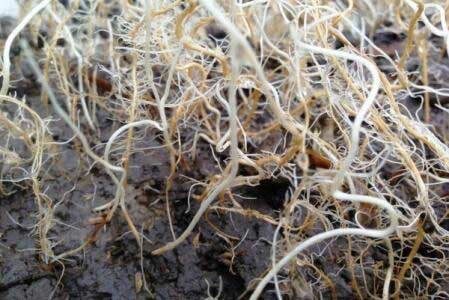 You can see that the roots are white in color, have good branching structure and are also deep. This is what we’re looking to achieve in your lawn. Healthy turf root systems need to be vigorous and deep in order to keep your lawn healthy during times of heat and water stress, as well as resist pests and diseases. Ideally, your St. Augustine roots should be at least 6-inches deep. Over-watering and watering shallowly contribute to poor shallow root systems. Unfortunately, this is usually what we see in North Texas lawns, due to heavy compacted soils and improper maintenance. 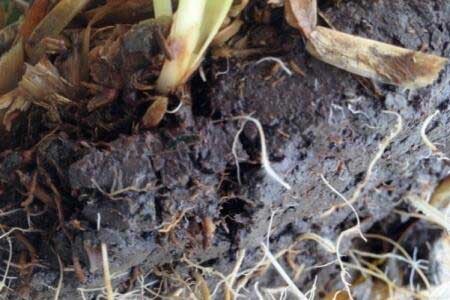 If you dig out a small plug of your turf grass, you can inspect the roots. How deep are they? Are they thick with many lateral shoots? Are they white and healthy, or does there seem to be a lot of brown rotted roots? Healthy soil means healthy roots: Healthy roots mean a happy and beautiful lawn. If you’d like to see improvements in your lawn, read more about our organic Soil Building program, then give us a call at 972.272.9211 or CONTACT US online.